Today's date holds a special meaning to me, and a very small handful of aviation historians who have heard about the legend of Three-Eight Charlie. It is on this day 48 years ago that a 38-year-young mother of three from Columbus, Ohio returned from one of aviation's most important thrill rides to become the first woman to fly solo around this planet. 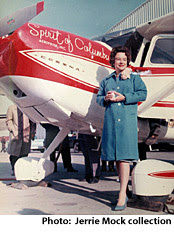 When Jerrie Mock touched back down at Port Columbus Airport in “Charlie”, it marked the end of what should have been considered to be one of aviation's few seriously legendary flights. She traveled over 23,000 miles, traversed five oceans, and made 19 stops spread around the globe. The story has endless twists, turns, suspense, high times and low points, and demonstrates how any one of us can achieve great things if we just want it bad enough. If you want to read my AOPA Pilot Magazine story “Aviation's Forgotten Pioneer” about Jerrie's flight, click here. After you read about Jerrie's accomplishments, it will boggle your mind how this story fell straight off the aviation history radar screen. Just to prove how forgotten Jerrie's flight is, go ahead and ask anyone out at the airport if they know the name of the first woman to fly solo around the world. Even though her flight was far more technically challenging and almost 20,000 statute miles longer then Charles Lindbergh's NY - Paris jaunt, it will surprise you that every pilot you ask knows of Lindy, but no one will know about Mock. And yes, half of them will think it was Amelia Earhart. I discovered this gaping hole in the aviation history books in 2000, and during the last decade, it was my passion to correct this malfunction ever. When I found FAA N1538C – aka Charlie – sitting disassembled in a Smithsonian warehouse that year, I knew something had to be done. So I launched a nationwide campaign to re-educate the flying and non-flying public about Mock's flight. 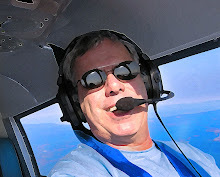 Many of my current blog readers may not know that in 2004, I obtained movie rights to Jerrie Mock's life story and historic flight from Jerrie herself which were exclusive for two years. I then teamed with a series of professionals to develop a full-length feature film screenplay about her and her flight, and tried to get Hollywood interested in what I feel is the greatest aviation story never told. So far I've been skunked. The dismal box office return of Amelia was more than enough to keep traditional studio executives from having their people call mine. After losing contact with Jerrie over the years, the project has stalled. I've neither the money nor the patience to wait for Hollywood to ever give this story the play it deserves. So my Bucket List now includes finding about $20 million in spare change to make the film myself. This is the greatest hangar flying tale of all time, and it will be a shame to never have the kids of this country and the world know that the sky does not care about a pilot's gender. An airplane cares not about whether there is a man or woman at the controls. Jerrie proved that tenacity trumps stereotyping any day.